Osaka is a very interesting city and definitely worth a two day visit. 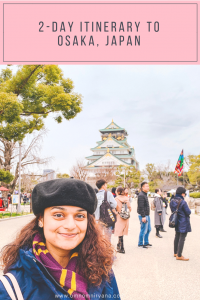 In this Osaka 2 day travel itinerary, I will highlight the main places to see and things to do while you travel through this interesting city, which has a completely different vibe than Tokyo or Kyoto. Delicious Rikuro’s cheesecake. Get them while they’re hot! Yes, you read right. I know it’s a bit outrageous, but Osaka’s main railway stations are something else, especially because it’s a total food haven. While it has two humongous shopping complexes attached to it, the Osaka station has an incredible underground food hall. 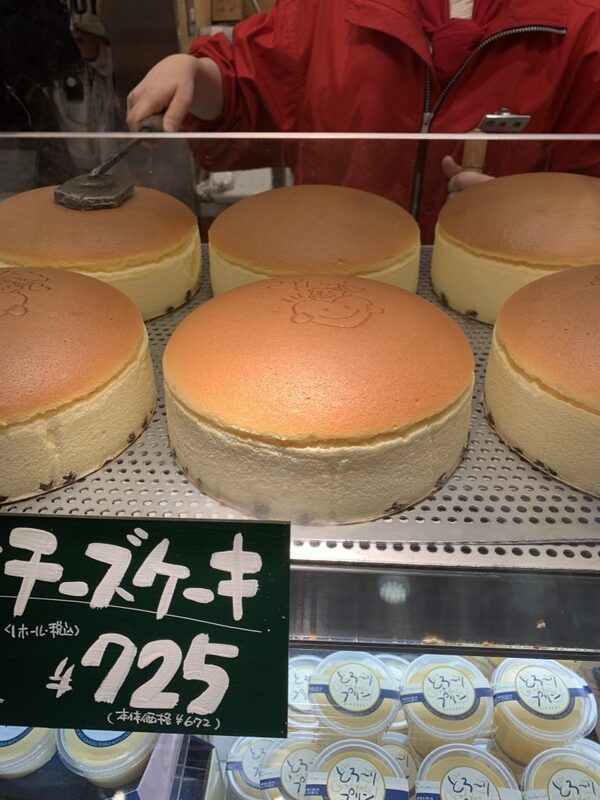 This is truly where you can eat some of the best food in Osaka, including the famous jiggly Rikuro’s cheesecake (big thanks to Delaine & Jackson from Of Travels & Tales for the recommendation!) as well as watch a tuna being sliced to make the freshest sashimi in town. F.C. and I went here to eat the whole time, that’s how much we enjoyed it. You don’t just get Japanese food here, there are Italian and Spanish restaurants with glorious food as well. The basement area of this station truly has a different energy. Feel free to indulge in anything and everything, as it’s all freshly made. Since it’s also a food market, you can choose to pick food from multiple places and devour all of them. Take some home if you want, even. F.C. loved this place so much, he even ate 3 chocolate croissants in one day! Beautiful & scenic, Osaka Castle should be your second stop on your Osaka 2 day travel itinerary. It is extremely beautiful, with a moat surrounding it, as well as gardens. It also has a lovely observatory on top, where you can get gorgeous city views. Each floor of the castle talks about the two families’ history of living there, so feel free to take your time browsing through each section at your own pace. The entrance charge to the castle is 600 yen (US$5) for adults. 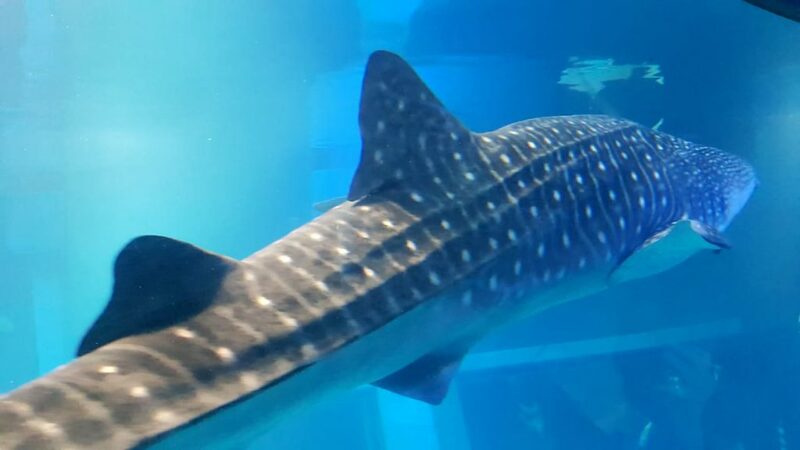 If you’re travelling with children, it’s best to head to Osaka Aquarium, which has a plethora of interesting exhibits from all over the world. Besides the famous whale sharks, you will also see penguins and seals. It costs 2,300 yen (US$20) for adults & 1,200 yen(US$11) for kids between 7 & 15 years of age. Kids between 4 & 7 years old are charged 600 yen (US$5), whereas kids below 3 years old can go for free. There is a giant wheel called Tempozan next door for which you can also buy combination tickets. Consider venturing out to see the Shinsekai area, which also has several eateries, including those offering you blowfish (or fugu). This area has been modelled after both Paris & New York, which explains the somewhat strange looking “Eiffel tower” called Tsutenkaku. The area was home to an old amusement park called Luna Park, again akin to the one that’s on Coney island, but only remnants of this stay. The Tsutenkaku tower has observatory decks, in addition to a Kinnikuman (manga character) museum. 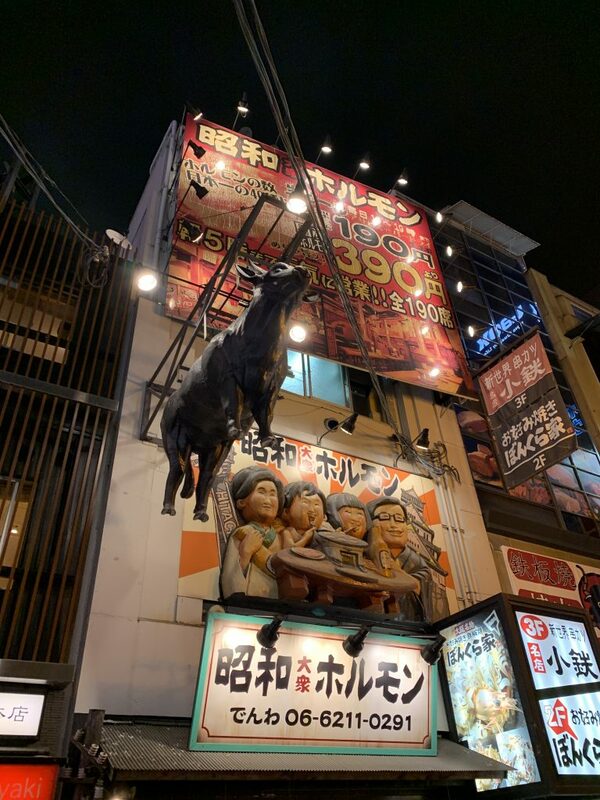 Dotonburi street is full of life by night, so you should definitely go here to grab a bit of dinner, to a bar or even to party. Several places have some of the most delicious beef from Kobe. They also have excellent seafood selections & of course, ramen. Head over to Pablo cheese tart for a sweet fix. The streets leading up to Dotonburi street are full of shops as well. Even if you are not particularly hungry (as we were), just soaking in the sights and the sounds will be a delight from the get-go. 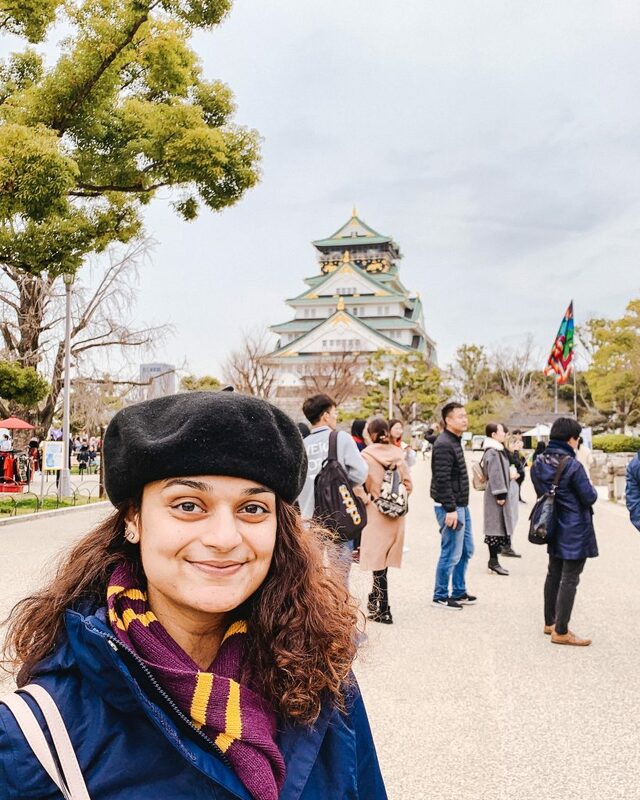 The Wizarding World of Harry Potter at Universal Studios was the highlight of my trip to Osaka! On the second day of our Osaka 2 day travel itinerary, Universal Studios was the highlight for me. Especially because it had The Wizarding World of Harry Potter. If you are a Potter fan and you haven’t been to any of the other parks, I highly recommend you experience this, because it’s nothing short of magical. Besides all the rides here, I highly encourage you to go on the Spiderman ride. There is a gigantic roller coaster (which was shut last time, but I was very excited to go for), called ‘The Flying Dinosaur’, which looked nothing short of epic. The queues at Universal Studios can get quite long, which is why I recommend you get an Express pass. It’s expensive, but saves you time if you have plans later. If you don’t speak Japanese, the rides like ‘Backdrift‘ & ‘Terminator’ might not make much sense to you. But still, overall a really fun experience. Full of deer, lovely shrines and a remarkable old city, Nara is definitely a place to check out. It’s easily accessible via the JR station at Osaka. Here’s what to do in Nara on your day trip. A place famous for beef, Kobe is accessible on a short 30 minute train ride from Osaka. Head to Mount Rokko, where you can enjoy some glorious views as well as Kitano, with charming homes reminiscent of olden Europe. Accessible with your JR pass. We had initially planned to go to Hiroshima on a day trip but realised it would be quite a long one. The commute back and forth alone would take 6 hours. You should see this historic town if you get the chance though, especially the Itsukushima shrine which has withstood the test of time. Using your JR Pass, you can easily go to Osaka from Kyoto in an hour. Within Osaka, you can easily travel using the JR Pass as most stations except for its metro line takes the JR Pass, making it much easier to navigate than Tokyo or Kyoto. In my opinion, the best place to stay in Osaka is near Osaka Station. The neighbouring areas might be a bit too quiet. We stayed in a hotel called Hotel Estay Ebisu which had by far one of the most spacious apartments, complete with washing machine and kitchen. It was in a much quieter area, but in close enough proximity (500m) to Shin-Imamiya Station. We decided to go to Hakone next, which I will share more of soon! I’m such a Harry Potter nerd. 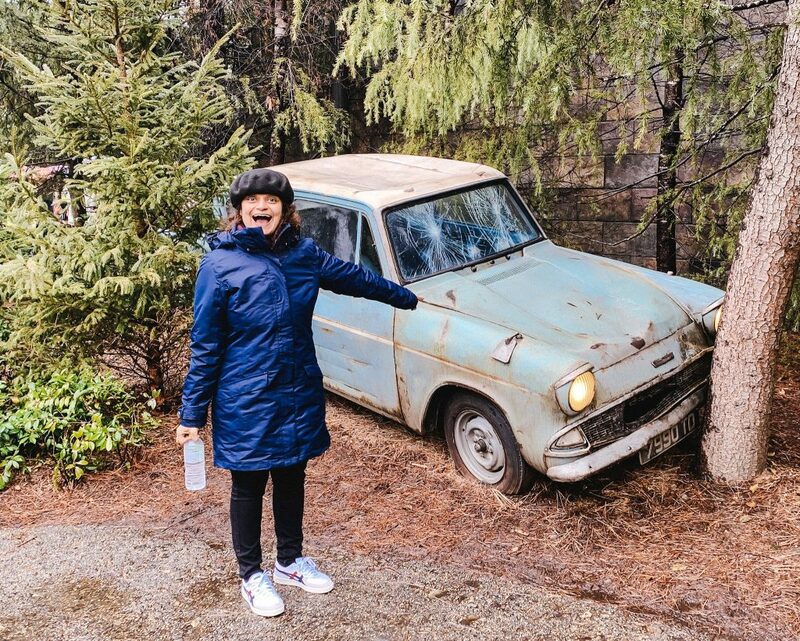 I think I need to plan an Osaka itinerary just to go see Ron’s crashed up car! I felt like a child all over again. It was amazing to relive the magic!